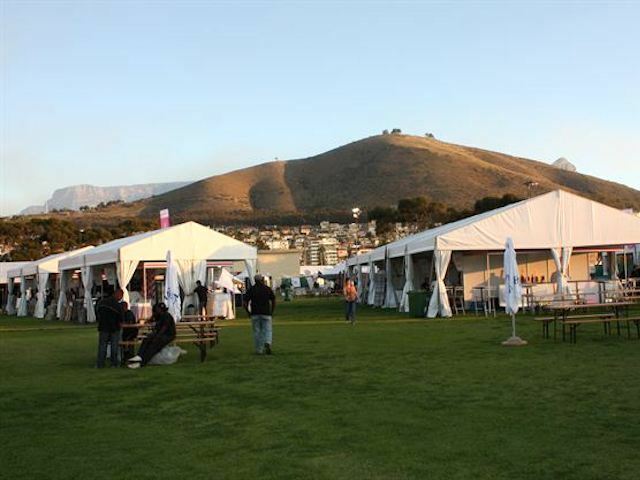 It took a lot of weaving through the white-tented oval community for me, in my trance like state, to digest all the colours sensations, sounds and aromas of Taste of Cape Town (and to register that I had in fact been walking in circles). All around me folk could be seen sprawling across white couches tucking into different tasters, bustling about with a determination to taste every single wine available, scampering to purchase more Scoins (the currency of Taste of Cape Town) and poking their noses into every demonstration, exhibition or stall, desperate to find the next best taste. “There’s so much taste, if it doesn’t taste lekker, chuck it!” I overheard a portly, red-faced man shout at his companion, to which she snapped, “This isn’t monopoly money, we’re here to get our money’s worth.” With 20 Scoins costing you 100 Randelas (and your average taster setting you back 4-8 Scoins) she was not far off the mark. One certainly has to choose wisely, and with seven restaurants (Il Leone Mastrantonio, Jewel of India, Azure Restaurant, Beefcakes Burger Bar, Camissa Brasserie, Cosecha Restaurant and Longridge Restaurant), additional pop-up restaurants (96 Winery Road, Makaron Restaurant, La Mouette, Societi Bistro, Burrata Restaurant, Jordan Restaurant, and Ernie Els Winery Restaurant) and a host of other temptations of the sweet variety, choosing becomes particularly challenging. There is always an impending fear of missing out on what waits around the corner, and I felt much like a kid in a flap having to choose one sweet from 500 in the aisle of temptation that leads to the tills at Pick n Pay. 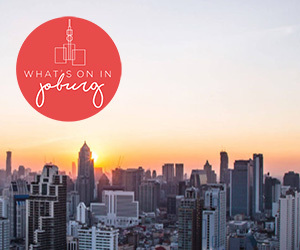 To save you from the horror of having to decide for yourself, here’s a guide of sorts to mastering Taste of Cape Town this weekend. It’s not all about the wine. If the art of cocktail making is your thing, be sure to visit the Consol Mixology Theatre where you can follow the expert shaking and stirring of Kevin Harwood and mix three fabulous cocktails “with ingredients that are as inspired as the glass they are served in”. Alternatively if you feel it is safer for an experienced barman to mix one for you, you are welcome to order directly off the menu. If you’re looking for a vibe: Don’t miss the Beefy Beefcakes Boys (who may or may not have their vests on) and enjoy a burger and a good old laugh during the drag show. You can’t miss them, “just follow the Abba music”. Need something more meaty? If you are a true South African, your nose should lead you to the Karoo meat being prepared at Robertsons Butcher Block gastro theatre. Here you can watch Chef Craig Elliott and local butchers rustle up imaginative combinations of Robertsons Spices and everyday ingredients to complement every type of meat. For us Elliott offered a taste of his mint, lemon zest, black pepper, salt, vinegar, apple, avocado, pear and sunflower seed concoction explaining how easy it is to mix and match. All the meat is cooked in a Big Green Egg-shaped apparatus, which is in fact a modern, ceramic braai based on the ancient Japanese Kamado clay cooking device. Bigger isn’t always better. When it comes to picking where to stick your complimentary wine glass, the bigger, recognisable names aren’t always the best ones. Venture to Fairtrade wineries where the focus is on sustainability and social upliftment or Waverly Hills for some incredible organic wine. Take the time to find out their stories, don’t just taste the wine, taste the brand too. Never too full for finger food. The Pick n Pay Wine & Canapé experience offers an interactive course on canapé construction, providing plenty of guilt-free yummy nibbles paired with wine. Inside the Lindt satellite studio, a mini replica of their studio in Green Point, you can drool watching those delectable, moreish Lindor truffles and pralines being created by hand and enjoy some Lindt Hot Chocolate in the dining area. Not satisfied? There are plenty of other stores and stalls selling sweets and savouries much like you would find at Cape Town’s weekly markets. And food food? Well do as I say and not as I did: take a few deep breaths read the menu on the pamphlet from cover to cover, circle the dishes you would like to taste and head off to find them without allowing yourself to get swept up by smells along the way. This will save you from following your stomach and being left, like I am right now writing this, in your very own food coma. 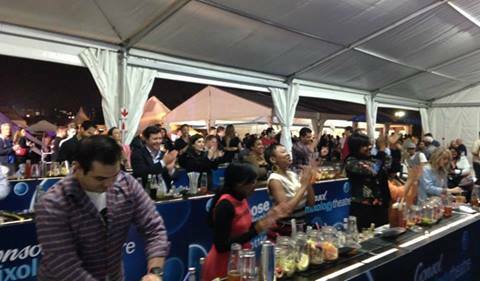 Taste of Cape Town runs from 3 – 6 April 2014 at Green Point Cricket Club.